While the charm of the movie Christmas in Connecticut speaks for itself, we had another idea for how you could enjoy watching this movie with your friends. Invite your friends over to write out Christmas cards to send to members of the armed forces. At the time that Christmas in Connecticut was filmed WWII was just winding down in Europe and military hospitals like the one where the fictional Jefferson Jones and his friend “Sink” were recovering were filled with wounded soldiers, just back from the fighting. Despite the difference in time between us and the fictional Elizabeth Lane, things aren’t really so different now–the war on terrorism has had many casualties and many members of the military who could use a little appreciation and love. In that spirit, round up your friends, turn on Christmas in Connecticut, and take advantage of the Christmas season to send care packages to your friends and family in the military. Or, send Christmas cards to soldiers recovering in military hospitals. There are programs for donating phones and phone cards to soldiers and their families so they can stay in touch, and programs providing military families with free postage. Whatever the cause closest to your heart, we encourage you to gather together to have some fun and share your Christmas cheer with members of the armed forces this year. How about spending Christmas in Connecticut? In this job market, who hasn’t considered padding their resume? But resume padding can come back to haunt you as Elizabeth Lane (Barbara Stanwyk) discovers in the classic Christmas comedy of errors Christmas In Connecticut. One moment Elizabeth Lane is at the top of her profession writing an enormously popular feature for the magazine Smart Housekeeping, the next she facing the prospect of unemployment all because her boss thinks she is a wonderful cook who has a husband, a farm, and a baby in Connecticut. But Elizabeth Lane, America’s favorite homemaker, is really a single, New York career woman who can’t cook, doesn’t have a baby, and lives in a small apartment that doesn’t even have a window box. What she does have is a newly purchased mink coat, a true friend in her “Uncle” Felix (S.Z. Sakall), and a boring architect, would-be fiancé John Sloan (Reginald Gardiner) who keeps proposing despite her numerous rejections. But all that is about to change. Who could have anticipated all the trouble and excitement that would enter Elizabeth’s orderly life when a nurse in a faraway naval hospital thinks that if her sailor hero fiancé could only spend Christmas with America’s favorite homemaker he will stop dragging his feet and set the date for their wedding? 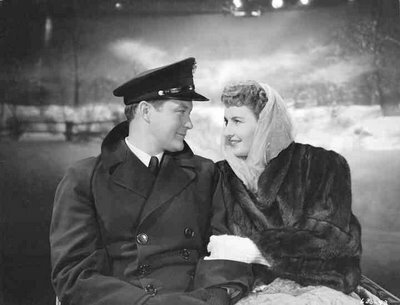 Unable to talk her overpowering boss, publishing giant Alexander Yardley (Sydney Greenstreet), out of sending her a sailor for Christmas, Elizabeth embarks on an elaborate, last-minute charade to protect her magazine editor and give this war hero his picture-perfect Christmas in Connecticut. This charade, however, is not without cost. Elizabeth is finally persuaded to accept John Sloan and marry him on Christmas Eve at his farm in Connecticut. All that is needed to complete the illusion of domestic bliss is a borrowed baby, but when the handsome sailor, Jefferson Jones (Dennis Morgan), lands on Elizabeth’s Connecticut doorstep—suddenly the prospect of marrying the stable but dull John Sloan is the last thing on Elizabeth’s mind. How does a girl win the man of her dreams when he thinks she’s married to another man? To find out, I suggest you spend your Christmas in Connecticut. 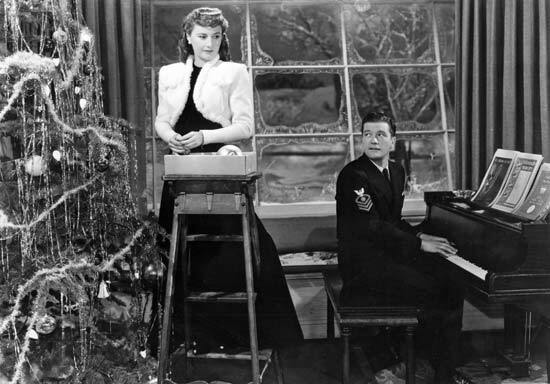 · In 1944 when Christmas in Connecticut was filmed, Barbara Stanwyck was so successful that she was the highest-paid woman in the United States. · Stanwyck was a four-time Academy Award nominee but she didn’t take home Oscar until 1982 when she was given an Honorary Award. · Sydney Greenstreet, who plays the indomitable publisher Alexander Yardley in Christmas in Connecticut, also appears in the films Casablanca and The Maltese Falcon. · Budapest-born actor S.Z. Sakall who plays Felix Bassenak in Christmas in Connecticut was also known as S.Z. “Cuddles” Sakall. · Christmas in Connecticut was remade for television in 1991 starring Dyan Cannon, Kris Kristofferson, and Tony Curtis, it was directed by Arnold Schwarzenagger. · The movie set used to depict John Sloan’s country home in Christmas in Connecticut is the same set that was used in the 1938 comedy Bringing up Baby. My fellow Starlet and I love this movie and have been known to watch it at all times of the year, but there are all sorts of fun ways you can tie this movie into your holiday party or as a special dinner-and-movie event. · Flippin’ flapjacks. The menus Elizabeth Lane writes in her magazine feature are elaborate and gourmet, but it is flipping a single flapjack that nearly gets her caught. Take a page out of the movie and invite your friends over for a pancake and pajamas party before you watch Christmas in Connecticut. As host, you can provide the pancake batter, have your friends pitch in and bring their favorite toppings like strawberries, peaches, and whipped cream, then get cozy and watch Elizabeth Lane work her magic in the kitchen. · Old fashioned Christmas. Christmas in Connecticut was released by Warner Bros. Entertainment, Inc. in 1945 when World War II was just concluding. Get your viewing party into the spirit of the time with music from the 1940s like Glenn Miller and Benny Goodman. Research menus and recipes from that era—maybe even find out what one of Elizabeth Lane’s recipes would cost. Mix up some retro cocktails. · “The things a girl will do for a mink coat!” Elizabeth Lane has promised herself a mink coat all her life and, feeling confident in the success of her feature, she buys herself one. Have your guests arrive for your viewing party wearing fur or faux fur coats just like Elizabeth Lane. Introduced to the market in 1931, by 1945 when Elizabeth Lane is flipping her first flapjack Bisquick was a staple in American homes. Uncle Felix, true gourmet that he is, might have turned his nose up at using a mix, but for novice and busy cooks Bisquick was a handy convenience food. In keeping with that spirit, here is the pancake recipe from Betty Crocker’s Bisquick Cookbook. Heat griddle or skillet; grease if necessary. Stir all ingredients until blended. Pour batter by a little less than ¼ cupfuls onto hot griddle. Cook until edges are dry. Turn; cook until golden brown. To Kill a Mockingbird is just one of the most profound pieces of art to ever come out of hollywood. I remember when I first saw it I was 9. I remember sitting there with the hair at the back of my neck standing on end because even at that young age, I knew I was witnessing something special. I have had a love affair with classic cinema ever since. Let’s start with out with The List. So everyone has a “List”of the best films ever made I am often disappointed in these lists because they include films like Indiana Jones, Star Wars, and other blockbuster films that while entertaining and yes even great in their way are more commercial successes then true art forms. There is something to be said about a list of movies that had to rely on only good acting, good scripts, and good directors and not much else. This was tough because there are so many that are great but after a lot of thought I narrowed it down to these 25 These are the movies that defined great story telling. Hello world, this is our very first post! And we mean it. Hi, and thanks for visiting our site! We’re really glad you’re taking the time to read this because we’re running out of family members to bribe into reading our stuff. We are the Sultry Starlets–we know, our friends say the name sounds too much like erotica. Our goofy name aside, we are two women on a mission to share our love of classic film from Hollywood’s golden era with the rest of the world. We don’t want our blog to just be something you read, but something you can use to throw a dinner-and-a-movie party night with your friends because, while watching movies by yourself is entertaining, watching them with your friends becomes a memory. When we let our imaginations run away with us we see this blog project becoming like a book group for classic movie fans. We also see ourselves as wildly rich and famous when we let our imaginations run away with us, but sharing classic film seems the likelier outcome. Right now we are new to the whole blog thing so we are experimenting, trying new things, changing page themes and content, and (probably) screwing up a lot. But if you bear with us and give us a chance, we think you will have some fun.